Episode 163 of Foster the Podcast is up! On this weeks episode: we interview the girls from one of LA’s hottest Improv/Sketch groups, the Duchess Riot. We find out what it was like being a beauty pageant winner, bad situations for improvisers, and how they teamed up with the Art of Charm to help guys get better approaching women. Also, things guys hate women do during texting. Subscribe on itunes! 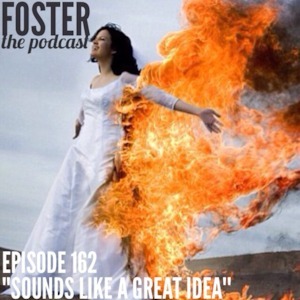 Episode 162 of Foster the Podcast is up! On this weeks episode: Justin officiates a wedding, fears for his life, and gets a strange email request. Plus wedding disasters, lies about what guys want in a women, and Kristie meets Justin’s new lady. Subscribe on itunes! Also, share this post and get a shout out on next weeks episode!! Holy Crap!! We just released our 160th episode!! On this weeks episode: Justin goes to a vegan festival, makes friends with a stranger at a Waffle House in Florida, and meets a woman who tries to call the cops on a comedy club. Plus, we learn about the “sniff” test and how Facebook can ruin a relationship. Subscribe on itunes! Also, share this post and get a shout out on next weeks episode! !